Keith Gilbertson Sr. taught, coached and mentored youth for 61 years at Snohomish High School – with your contribution his memorial scholarship will last even longer. 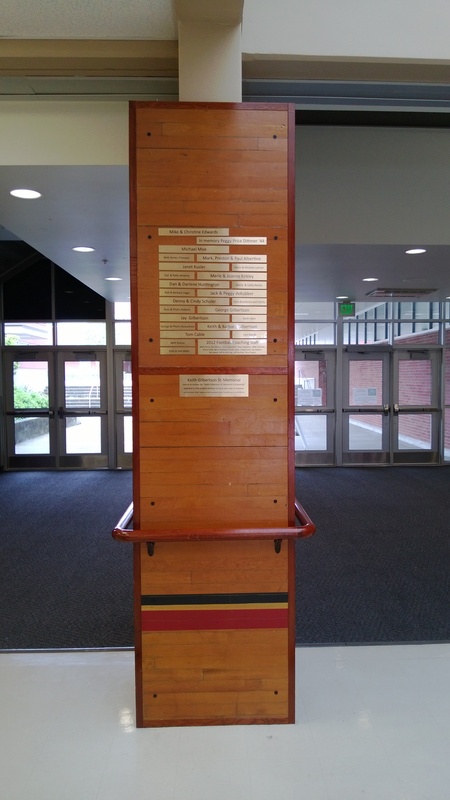 The Gilbertson Memorial with its first set donor "legacy plaques" honoring contributors to the Keith Gilbertson Sr. Memorial Scholarship fund. You can join them with a donation of at least $61 – a dollar for every year he served. Click here to read how Gilb inspired three generations of Panthers on and off the field. Click here to view photo galleries from Gilb’s career. Click here to add your story how Gilb made a difference in your life. Click here to support Gilb’s scholarship with an option to have your donation honored by words of your choosing on the Gilbertson Memorial. Click here to see more about about the Gilbertson Memorial. Click here to learn more about Gilb’s scholarship.